I am so excited to update you all on our first ultrasound. Long story short, everything looks great. We have a wee little one in there growing for all she is worth. And the best part is, she’s in the right spot! Just a quick not on the pronoun usage here. It’s really cumbersome to write “he or she” constantly. For now, I’ll just use the female pronoun. The doctor said that things look fantastic. 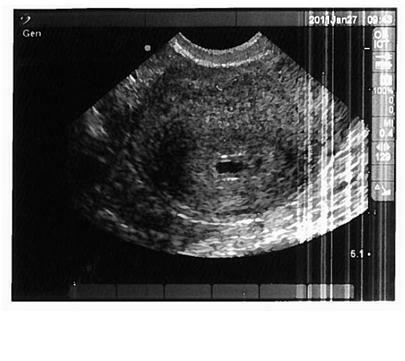 We were not able to see the heartbeat, but that is to be expected at this early stage. We did see the her little yolk sac though, and surrounding it is what the doctor referred to as a double ring. Apparently, having this double ring appear is an indicator that this is an actual pregnancy and that there’s a little something that really is growing in there. In the picture below, the dark oval in the middle is the amnio sack and the white lines above and below are the double ring. A quick look around in my pelvic area revealed no extra babies growing where they shouldn’t be, and my husband was relieved that there is actually only one yolk sac. He had to endure some good-natured teasing from me about that because my hGC (pregnancy hormone) numbers were so high. Still only the tiniest signs that HG might be on the horizon. The occasional 5 minutes of really needing to just sit very still crop up a couple of times a day. It’s still too early to think that HG will pass me by this time, but I can certainly hope. I feel the most questionable in the evenings. Crummily enough, it’s right around story time for the Grasshopper. So far, though, the wristband and the Unisom/B6 are keeping things under control. It was a pretty happy morning. My symptoms have been mild enough so far that it was nice to see that there actually is something going on in there. I’m scheduled for weekly appointments moving forward. Next week’s appointment is on Friday at 9 AM, and we’ll have another ultrasound at that time to make sure we can see a heartbeat. Glad she found her way down the fallopian trail! I’m beaming with happy for you! What a beautiful picture! I’m happy that all is well and you can breathe a sigh of relief. Thank you for your kind words. I understand about stepping outside of our comfort zone. People like “Charlie” motivate me. And then stories like Juliana’s cause the mother bear in me quit thinking about something so trivial as my comfort zone. Until next time, little momma. I may have missed some of the blog, are you contacting your church and crisis center for help? Had you discussed all this ahead of time. How wonderful to have community like that if that is the case. Good news about your singleton 🙂 grow baby grow! Actually, the idea was for me to contact them to provide info about HG and help them to provide meaningful help to women who might call in to them for help. Not sure if I am going to be able to do that right away if I am sick. Congratulations! I will be praying for you. Always thought of myself as a combination of Superman and James Bond, but I guess Charlie will do for now. Just don’t confuse me with that Chicken of the Sea spokesfish. Or that Good N Plenty kid. Pal, 3 words: warm prune juice. Congrats on the fetal feng shui! If you’re able, yes. It’s either that or explode! LOL! Where are you on eating and drinking now?